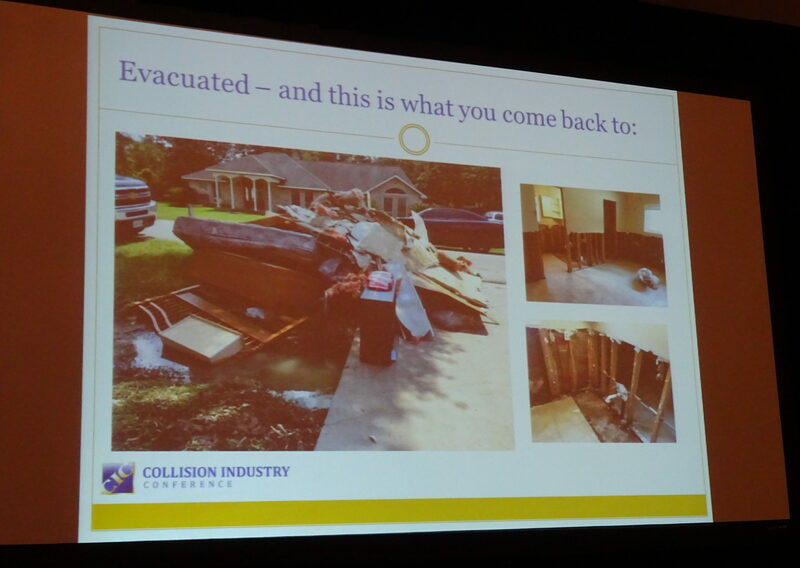 The Collision Industry Foundation last month said it had helped 63 auto body repair industry families, three “severely impacted” shops and one vo-tech school this year following disasters like Hurricane Harvey. The 501(c)3 charity, which provides replacement tools and necessities to collision ecosystem professionals impacted by catastrophes, announced earlier this year it would help victims of Hurricanes Irma and Harvey. 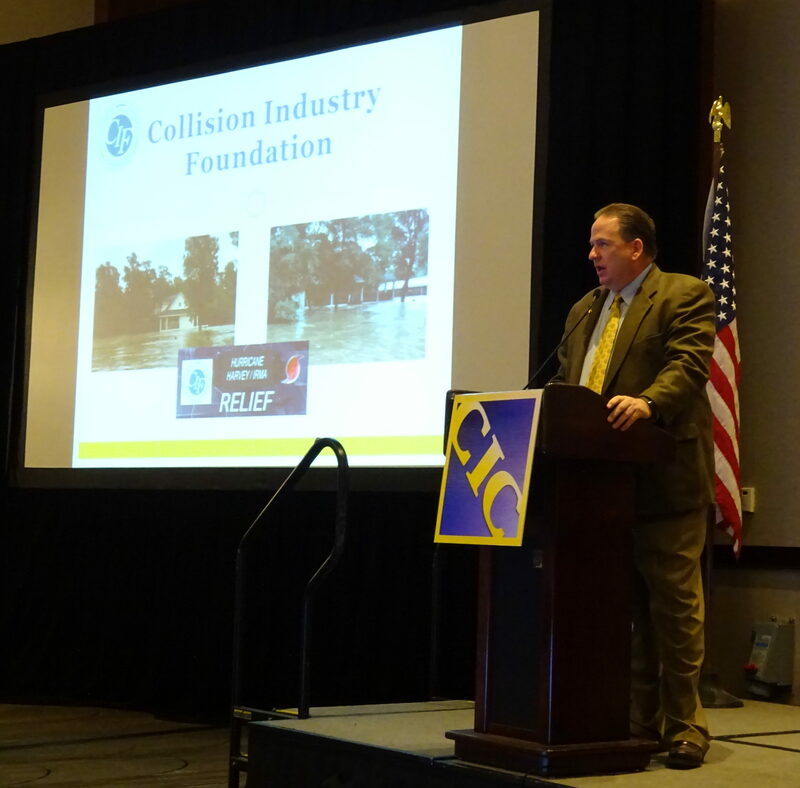 In a Collision Industry Conference presentation, CIF disaster relief Chairman Michael Quinn gave the industry an overview of the charity’s efforts and the kind of lives industry donors touched. Some of the recipients of CIF’s aid were present for the Oct. 31 event during SEMA Week. “Imagine that’s what you come back to,” Quinn said, showing a slide of devastation. “A lot of areas that did not normally flood, were flooded,” Quinn said, and pointed out also that officials deliberately flooded part of the region as a larger safety measure. Another technician assisted by the charity said he had to postpone a root canal indefinitely to buy clothes for his family. A family of repairers took the money CIF gave them and put it towards their practice of boarding equestrian horses for the Special Olympics. CIF also helped Kingwood Park High School‘s vo-tech program. Quinn said collision repair head Jeff Wilson described the technical program as “‘last on the waiting list'” in terms of aid, as other schools in need of books and supplies were rated a higher priority by officials. 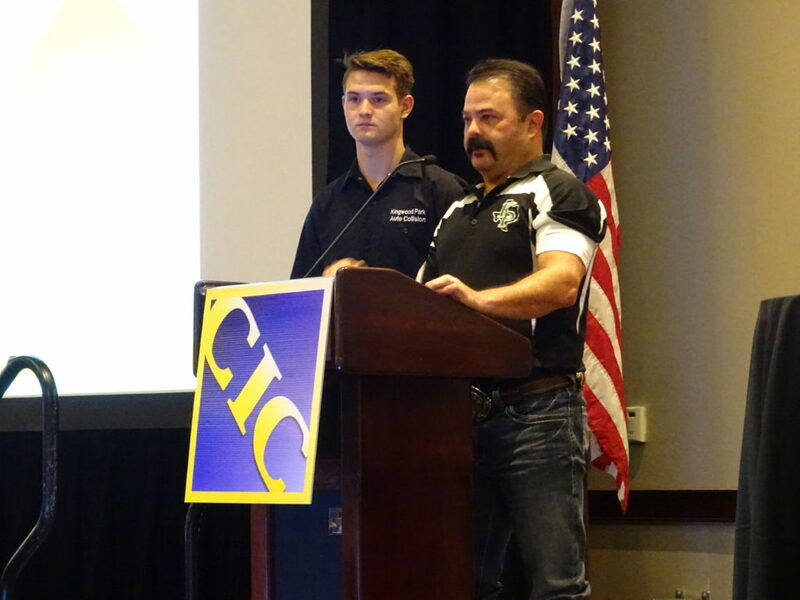 Wilson, who was present at CIC along with collision repair student Cameren May, said his three-year program’s first-year contingent included 77 students. After Hurricane Harvey, students began to unenroll because they knew the storm had affected Kingwood Park High. But Wilson started to get phone calls from the “wonderful industry” and assistance from the CIF. Donate to CIF here, and request aid here. You can also email collisionindustryfoundation@gmail.com or call 855-424- 3243 or 804-427-6982. Also, don’t forget that the Collision Industry Foundation is on Amazon Smile. If you designate them as your charity and buy stuff on smile.amazon.com instead of the regular Amazon website, the retail giant will donate a little bit to the foundation every time you buy one of millions of designated products.